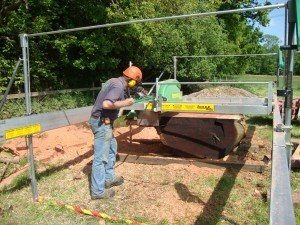 JDB forestry contractors near Eversley boosted their business when they received a LEADER grant to purchase a new tractor and rotating wood splitter. This meant that the biomass production side of the business could grow, by enabling a more efficient and powerful tractor to operate their chipper, boosting production of woodchip whilst saving energy and road miles. The wood splitter enables the processing of much larger wood, reducing waste from forestry operations. LEADER has helped the micro-business to thrive and two years later, the business was ready to expand further having boosted income from the woodfuel. Paul said, “This grant has really helped our enterprise to grow and has made such a difference to our income, we have even employed an extra hand to support us from the local area”. The business benefited from subsequent LEADER funding, purchasing a mobile saw mill and firewood processor. Paul continued, “We are now able to process the timber and create a usable material, selling sawn timber from our yard. We have already identified a market for bespoke sawn timber products such as large gate posts and other garden timber. By processing the timber, we have significantly added to its value”.